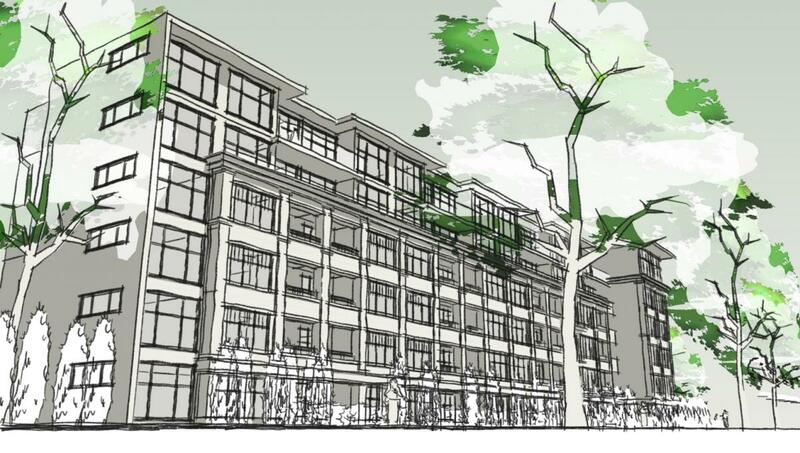 Here are some renderings for the proposed 87-unit rental redevelopment of the Beacon Arms property at 505 Quadra in Fairfield. Floor plans, display boards, and other information is available at http://fairfieldcommunity.ca/caluc/ . It certainly appears to be an improvement over what is there now. It would be great to see all of the 1960s/70s era apartments along Cook Street get this treatment or more. I like it. Don't know what the exterior is, think it would look great in some hudson-like terracotta. 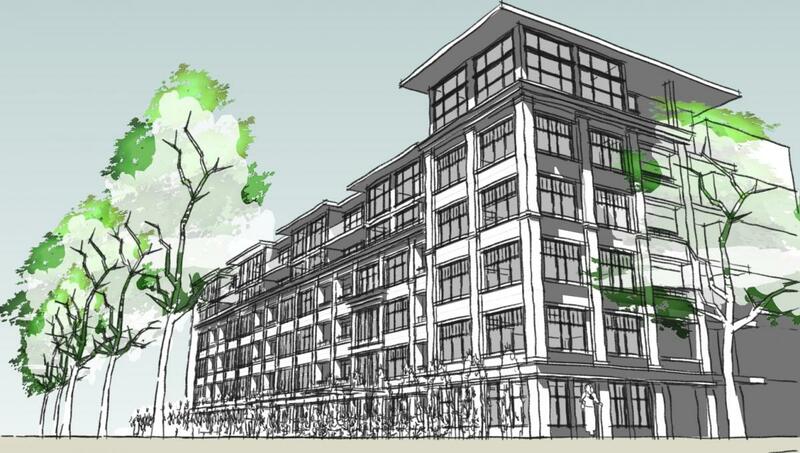 One of the positive aspects of this proposal is the unit mix: 42 1-bedroom units, 41 2-bedroom units, and 4 townhouses. The vast majority of the 2-bedroom units are 1007 square feet, which is a fairly generous size; the remainder of the 2-bedroom units are 833 square feet and 922 square feet. The 4 3-bedroom townhouses are 1671 square feet, so the inclusion of family-sized units in the mix might be enough to secure the support of Mayor Helps. Thanks for the info, Kapten! It'll be interesting to see how council handles opposition to this development considering it's more than doubling the on-site density. A moratorium on demo'ing older stock at a time when every unit makes a difference could backfire, just like the City's decision to convert budget motels and hotels into affordable or social housing created the impetus for the AirBnB industry. Never assume ideology won't trump reason & logic when it comes to the decisions of this Council. Well, are they going to bring in a demolition moratorium, or not? And how will it apply? You can't bring it in then spot apply it. And sooner of later someone is also going to propose to just tear their building down an build a new version (like the Clive more or less) and that has to be approved, I'd think. The demolition moratorium will be discussed at this Thursday's Committee of the Whole. And, in advance of this discussion, a representative of Analogue Projects (owner/developer of Beacon Arms) was on CBC's "On the Island" this morning discussing the Beacon Arms redevelopment. I only caught the last 5 minutes or so but there are numerous problems with the existing structure right down to the foundation. ...Analogue Projects (owner/developer of Beacon Arms) [said] there are numerous problems with the existing structure right down to the foundation. People (officialdom included) are going to have to come to terms with the fact that much of our local rental housing stock is getting quite old and without a significant influx of money the so-called "affordable" housing is going to fall into disrepair. Rents are going to have to go up just to maintain what already exists. What most of the folks pushing for a moratorium will never admit is new tenants coming into older buildings are directly subsidizing long-term tenants who are paying significantly below market value for their units due to rent controls. How does the community benefit when Mary in suite 105 pays $750/month for a unit, while Billy in 107 (and 15 other newer tenants) have to pay $1,050/month because Mary and 15 long-term tenants are still paying hundreds below the market value and not contributing enough to the upkeep threshold required to keep the building from falling into disrepair? Also brings forth the issue of what to do with tenants in a building that desperately needs replacing, such as the current one in this project (but could apply elsewhere). The rental market here is hard enough, what do you for a hundred soon-to-be displaced tenants all at once? ...The rental market here is hard enough, what do you for a hundred soon-to-be displaced tenants all at once? Not all tenants will be displaced at the same time. As people give notice of moving out, vacancies won't be filled. I also believe all BA tenants are being offered first right of refusal on vacant units the owner of this property has in other buildings in Victoria. I guess one thing government could do to ensure a steady supply of rental units is to contract to pay the rent of any unused new apartment for a period of time. Building rentals from a developers point of view is a balancing act - build too many and they will sit empty so they delay building them until they can assure themselves of an almost full building. If the government would cover the costs of any vacant unit that would take the guess work out of it for the developer. Once you have an adequate supply and a 5% vacancy rate you can cancel the program. Was at the Hudson party tonight, only two rentals left in their newest building. Both two bedrooms, one is 2700 and the other is 3200 a month. Don't think government needs to subsidize anything being built. When I was on CFAX this week talking about the Beacon Arms the owner called in and updated us on what he's doing with tenants. He said even in this market there is a 20% tenant transition so units come up constantly. He has other buildings the tenants can move to, and once the new building is completed they'll have first dibs. On a different note I wonder if this proposed development will include in-suite laundry for each unit? It certainly seems to be a feature in most of the newer purpose-built rentals..
Oh, I think so. Easy to do with new-builds.